The location was in Alexandria Virginia on a registration desk for a conference in a hotel. The "Take It!" was a rare visit to this part of the hotel which had this huge visual reward. 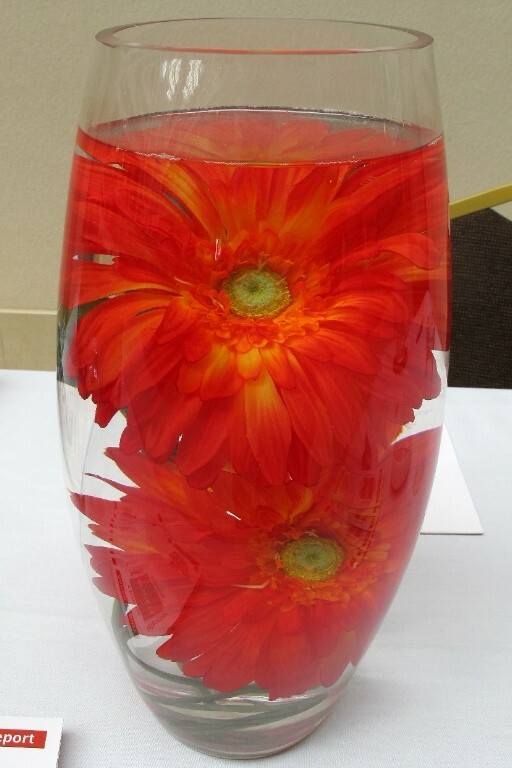 The flowers in this vase were the only decoration on the table. The color was very vibrant to say the least. That the flowers were just the floral heads was a most unusual presentation being on their sides. I had seen single flowers usually with the bottom being straight down and the only thing being seen was the straight up view of the flower. That the vase was filled with, presumably water, which matched up with the distortion presented by the curvature of the glass vase served as a magnification of magnificence. The overhead lighting was just right to produce subtle shading to the center of the flower to bring about an eye like appearance. The little bit of reflection from that same lighting source helped enhance the effect. I do not want to minimize the size of the flower, for it was huge on its own. The After Take: This is another in the ongoing saga of happening upon the unexpected. I find I am constantly having to challenge myself to stay open and aware to my surroundings. Being just aware is not enough, for I know I can get ever so comfortable with the familiar that subtle changes let alone medium sized ones can get overlooked and missed. Sometimes huge treats are available from just looking at the same thing in a different way. So, it is an ongoing enjoyable exercise to keep myself in training for awareness. Here is hoping you have the rare treat of having a flower looking at you and you take the time to look back. Beauty is in the eye of the beholder could never be more true. Thanks for joining us for the current photo presentation. You are cordially invited to return Tuesday, May 29th for a new picture that we hope you will enjoy. Wow that looks really neat. Cool picture. Really like "BAM, in yo face!" Reminds me of those jars the mad scientists have that have like a baby pig inside them. But this one actually looks pleasant. What an interesting decoration. I wonder how long the flowers stay fresh looking.